At St. Michael's Theydon Mount and St. Mary's Stapleford Tawney we recognise that there are special spiritual moments in our life that are recognised by special services. Both churches offer these special services. Should you be interested in finding out more, please use the Contact Us button below and indicate on that form which church you would like to enquire about. In 2008 the rules on getting married in a particular church were simplified (www.yourchurchwedding.org). Regularly attend. By attending church regularly for a minimum of once a month for six months you can become eligible to be married by banns as if you lived in the Parish. Common Licence. This requires one of you reside in the parish for a minimum of 15 days before the issue of the Licence. Application can be made to the Diocesan Registrar or a local clergyman acting as a Surrogate for marriages. Special Licence. Application can be made to the Archbishop of Canterbury for a Special Licence. This is an exceptional means and is only advised when there are good pastoral links with the church in which you wish to marry. For further information please read the Church of England's 'Life Events' section on Weddings. To make arrangements or to ask questions please use the 'Contact Us' button below. The basic fee for a wedding (at all Church of England churches) is £456. 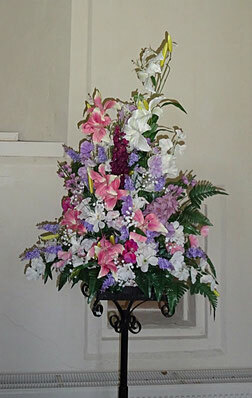 Church flower arrangers can arrange the flowers in church or a florist can be brought in. If you would prefer to use our services then you would be required to pay for the cost of the flowers plus an agreed donation to the Church. There is a deposit of £150 on booking and the balance is paid by the time of the wedding rehearsal. Both churches have extensive grounds where photographs can be taken and St Michael's Theydon Mount has a large car park. The Benefice has had a close relationship with the family who own the estate of Gaynes Park, Essex. We are therefore delighted to recommend Gaynes Park as a beautiful reception venue to compliment your wedding in either of our churches. The Barns and Orangery at Gaynes Park, which became the National Winner for ‘Best Venue’ in the 2012 Wedding Industry Awards is situated just a few miles from either Church. Please use the ‘Contact Us’ button below with your details and questions and we will respond as soon as possible. St. Michael's and St. Mary's welcome new candidates for Baptism. Baptisms of babies, children and adults can take place during congregational worship starting at 10:30am on a Sunday morning or in a separate service that can be arranged. The clergy are always ready and happy to minister to anyone in either parish who asks for them. After a death, family or friends of the person who has died usually ask a local funeral director to make the arrangements on their behalf, but you are welcome to contact the Vicar directly, if you wish. The 'Contact Us' button below can be used. Families are welcome to use St. Michael's or St. Mary's for the funeral service. 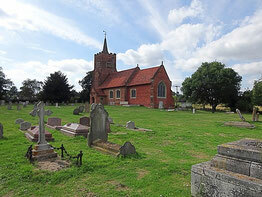 The churchyard is open for new burials to persons resident in the parish or on the electoral roll at the time of death. There are rules governing memorials and headstones which apply to all churches in the Diocese of Chelmsford. They can be found here.